If you love something, set it free. Soylent and the people involved have become the loves of my life. Starting from scratch and turning my passion for a better food system into a booming business with world class products and employees has been the experience of a lifetime. And both the business and I are still quite young. I have seen the company evolve with scale, and done my best to guide it toward my vision and support those involved. Along the way I have seen my role as CEO evolve, especially enjoying the process of delegating my responsibilities to more skilled and experienced scientists, managers, and executives. These specialists are clearly better at their roles than I would be, especially if I were handling tons of other responsibilities simultaneously, which is the exciting early stage of a startup. But that time has passed. After much deliberation I have decided to pass the reins to a new CEO with more management and industry experience. Effective immediately, I will support Soylent as Executive Chairman. As Founder and largest shareholder, as well, I will still do everything in my power to ensure its continued success. Over a year ago it was serendipity that introduced me to Bryan Crowley. Bryan is a passionate, creative, experienced leader that knows the food and beverage industry inside and out, and is dedicated to supporting and developing those around him. 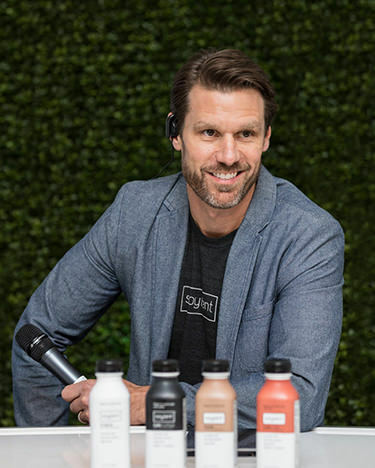 He has been Soylent’s President for the better part of a year and has already had an untold positive impact improving our distribution, marketing, supply chain, product, and organization - all the things a good CEO should do. We have put in place a three-year roadmap for the business, and I have complete confidence in the Leadership Team’s ability to execute it. I am more motivated by the success of the company and brand than my own title. I have no doubt this is the best thing for both the business and myself, and am excited to watch Soylent continue to grow into a huge, impactful business. First of all, I want to take a moment to say hello and thank you to all of our Soylent friends out there who have helped turn Rob’s vision into one of the most talked about and fastest growing brands in the food and beverage industry! I’ve been in this industry my entire career, and I’ve never seen anything like it. I couldn’t be more excited to be part of this community and take on this new, expanded role for the company. Rob and I have spent a lot of time together since we met just over a year ago discussing the history of the brand; the people here, both past and present, who have helped get us where we are today; and our shared vision for the future. We also spent a lot of time just getting to know each other and our friendship has grown each day. When Rob asked me to step into the CEO role, I told him I had one condition - I would only do it if he would continue to partner with me to help bring our vision to life. He agreed, of course, and Rob will continue to be a guiding force in his new position as Soylent’s Executive Chairman. In the last year, we’ve been very busy and the company has seen tremendous growth. We’ve introduced two new products in Soylent’s Cafe line, Cafe Vanilla and Cafe Chai, and I’m thrilled to share that Cafe Chai recently won Best New Product at BevNet’s Best of 2017 Awards. Amazon has been an amazing partner helping us get more Soylent in the hands of more consumers nationwide, and we’re now one of the fastest-growing brands on Amazon, as well as #1 in the meal replacement category. This past summer, we partnered with our friends at 7-Eleven to test expansion into retail and blew away our expectations. Now we are expanding with 7-Eleven and other retailers in markets around the country. And I’m also proud of our #SoylentforGood program, which has donated over a million meals and counting, sent meals to support disaster relief and contributed funds to the World Food Program USA to support their mission of Making Hunger History! When you’re trying to do something truly innovative, there will of course be challenges. We’ve had a few along the way, but we’ve learned from each one and have come out on the other side smarter and more determined than ever. So where are we going from here? One of the first things Rob and I did together when I joined as President was to define our vision and mission. We didn’t hire a bunch of consultants - we worked with our team, and what we came up with has been the driving force of the company from the beginning and will continue to provide the focus we need to truly make a difference. Our vision is big but simple: we want to change the way the world looks at food. How? By leveraging science and technology to provide complete, convenient, and sustainable nutrition to the world. That’s our mission. Rob proved that you can use smart science and deliver an affordable and sustainable food in a powder form that you could actually live off of. And Rob did just that, consuming only Soylent for 30 days - now that’s commitment! Many of you did the same thing and shared your experiences with the world, and the rest is history. 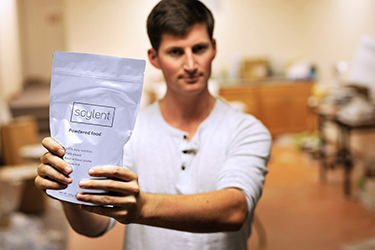 Next, Soylent changed how you can get your food by selling online with an innovative subscription model. With the launch of ready-to-drink Soylent, we are proving that you can “drink” a complete, nutritious and filling meal on the go, at the office or whenever you need to fuel your day. And there’s more to come. People always ask me if we’re trying to eliminate traditional food. The answer is no - we love food. It is connected to the fabric of what defines cultures and makes us human beings. What we do want to replace is all those times you need food as fuel, and you either skip a meal or make an unhealthy, unsustainable or expensive choice throughout your busy week. We call these “food voids” and we’re on a mission to make them obsolete with a healthier, more sustainable choice. I want to end by thanking Rob and wishing him the best in this next stage of his journey. His continued support is invaluable, and we are all indebted to his passion and commitment for the company he created and the community he cultivated. I look forward to working with him in his new role in the months and years to come. And thanks again to the Soylent community - I am excited to continue getting to know you in my role as CEO as we work together to change the way the world looks at food. It's here—Soylent Squared. The first probiotic-infused mini-meal that gives you power with gut-relieving benefits. Coming in at 100-calories each, you can stack them or use them as quick snacks. Learn all about the most powerful new snack in your pantry. Sometimes our gut like us. Sometimes... not so much. With the help of pre and probiotics in our new Soylent Squared, we can master the balance of a healthy, symbiotic relationship with our GI tract. Learn more. At Soylent, we live and breathe for soy. Soy isolate is the core of our meal replacement shakes and drinks for many reasons. And, we love it for more than it’s silky smooth texture. Read about our many reasons and why we love how soy impacts your body.